I am out on a walk in downtown when I smell a tulip that serves as a dog’s version of Proust’s cup of tea. Dogs, particularly miniature long-haired dachshunds, don’t do tea. That tulip takes me back to the first time I heard birds sing; i.e. I had a flashback. I was nine weeks old and Shelley, my pet parent, had just brought me home in February 2008. She introduced me to the backyard, where I was supposed to do this thing called potty, and I heard twittering going on. I cocked my head, my eyes widening, and I looked around. What was that? I asked with a sniff in the air. “Oh my gosh! You are so cute!” Shelley said, gazing at me with the I’m-so-lucky-to-have-this-particular-dog look. That was the second time I heard the word “cute” – the first was when Shelley and her mom visited me in the pet store. They were saying that I was expensive and something about wanting to rescue a dog – rescue me! – but that I was too cute not to take home. Cute soon became part of my identity. 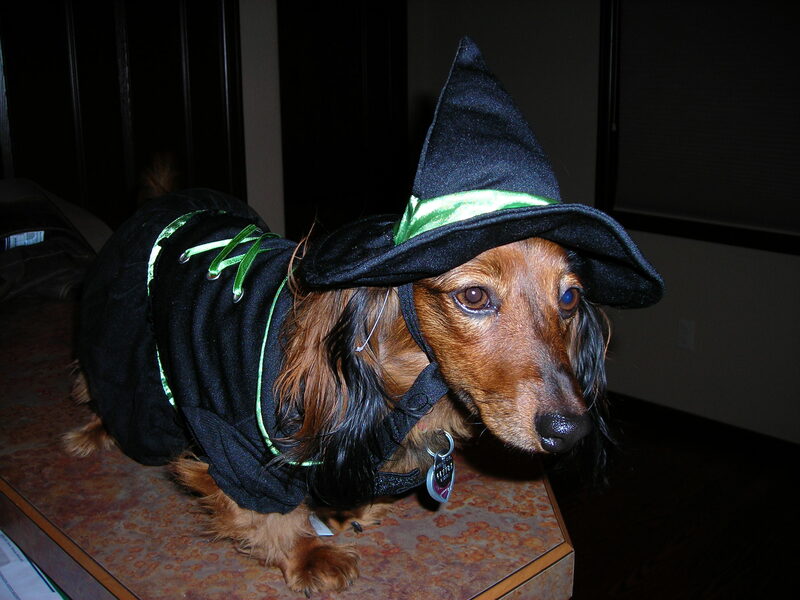 So, on this walk, Shelley and her friend Tim are talking about her blog on flashbacks, and Tim said, “You have to put up a photo of Zoey’s witch’s hat. Oh-h yes, lots of memories are triggered by my Halloween costume from last year. Shelley, Tim and I were in southernColoradovisiting Tim’s family and they did a photo shoot with me in my costume for a cute dog contest (which I didn’t win and still find to be a bit upsetting). Another time we were out in the yard, I did my potty thing along the fence and when we turned the corner, I saw this great expanse of fields that went on and on until it hit the sky. There was no way I could pee on all that. I let Tim know with my eyes that this Fowler place is sure strange. As are flashbacks, because they take me out of the present moment where all my senses are activated to a place and time where I was learning how to be and become me. See Shelley’s blog at http://shelleywidhalm.wordpress.com/2012/04/29/flashbacks-on-track/. 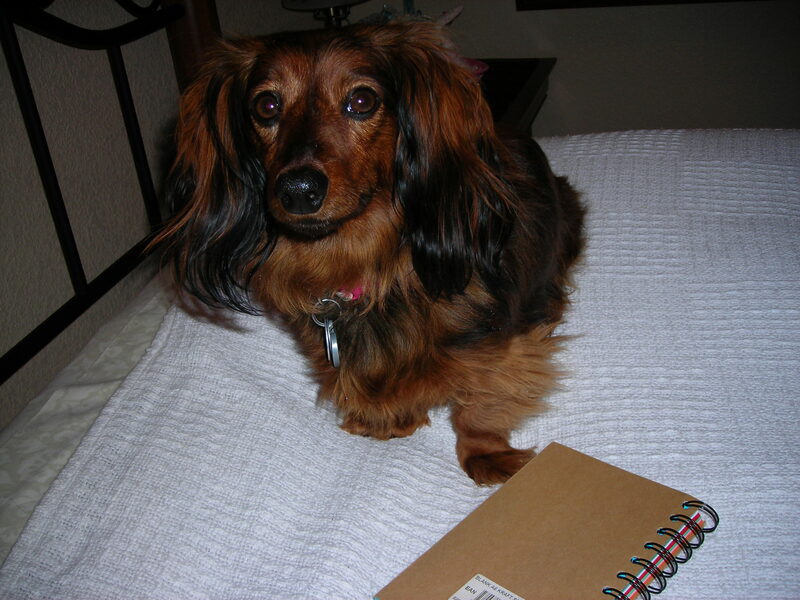 Zoey the dachshund believes that all story plots should be centered around her. In a dog’s world, there may be such a thing as subplots, but, for me, it’s all about the main plot. The main plot is what happens to and around me, particularly when it concerns food, going on walks, playtime and treats. 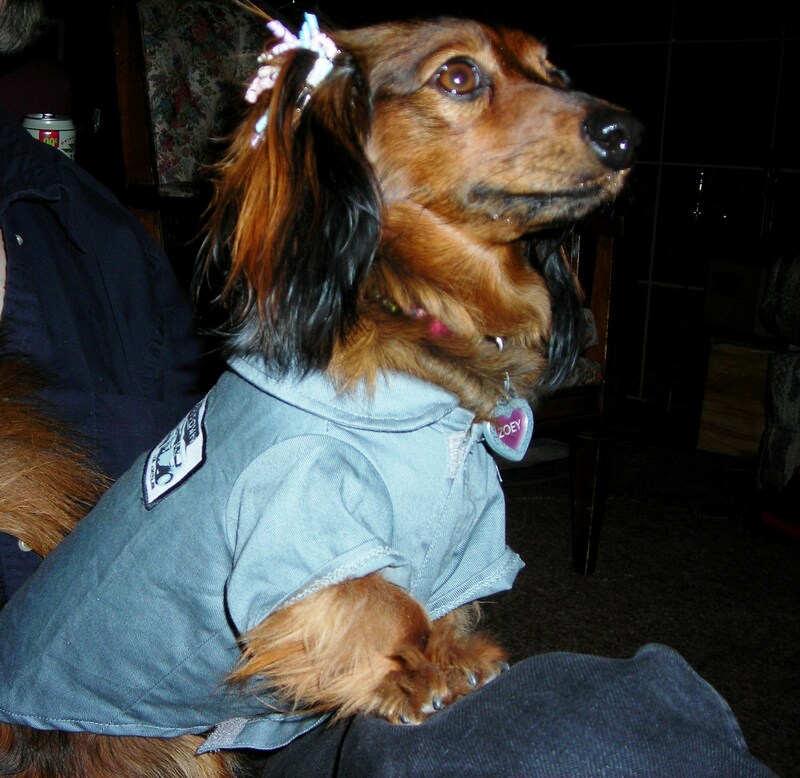 As the cutest dachshund in the world, I hook readers with the fact that I am cute and in how I express myself. When I encounter big dogs and cats, I bark extra loud to tell them to find their own story. They are not allowed to play any part in my plot, even though they are minor characters, so minor in fact that I can’t see or hear them. MEOW! Hey cat, get out of my story. Oh, I see a big Dalmatian while I’m on my walk. BAARRKK! Is he seriously shaking his head, as if I’m some 9.5-pound little dog? I am so, so insulted. BARK! I have the bark of a big dog, I let Mr. Dalmatian with his way too many spots know. It is so unfair, I think, as I stick my nose in the air and continue on my walk through downtown, owning my world. I love it when people (i.e. minor characters) stop and ask to pet me. They are begging to have a chance to enter my world, and I let them, but only temporarily, as I roll on my back with the “pet me, please” tail-wag. After about five or six petting sessions with various minor characters, I return home for some treats. My favorites are rawhides, milk bones and miniature cowboy steaks. To sum up, this is the plot of my day: get up, pout when Shelley, my pet parent, goes to work, nap and bark at noises, run in joy circles when Shelley comes back, go on a walk with Shelley, play with Shelley and say goodnight. Goodnight. I guess that means The end. Zoey the dachshund is proud of her storytelling abilities. Call me Zoey (not Ishmael). From the heights of my second-floor patio, I have the point of view of seeing everything onFifth Streetfrom the bar to the newspaper. I smell cooking food from the restaurant below. It’s my Proustian cup of tea that brings about memories and longings of good human food. Yep, I’m a dog who faces the eternal food dish of boring and organic (yuck!) dog pellets. I prefer the more exciting scenes of my life that happen on weekends, i.e. when Shelley is not at her stupid work. Scene 1: Zoey, curled against Shelley, stretches and leans her head back. “Are her eyes open?” Zoey wonders. 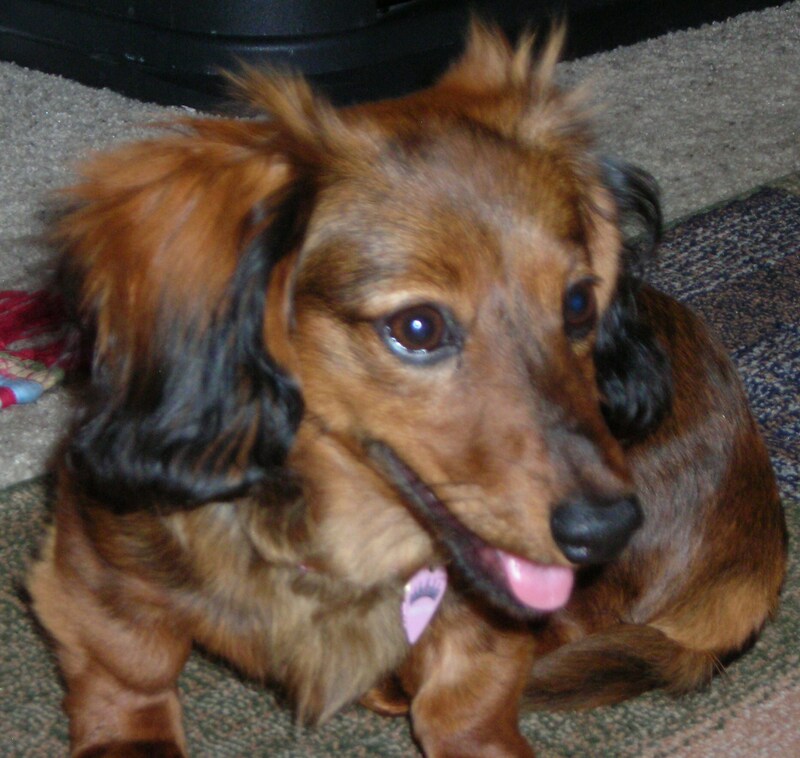 With a tail wiggle, Zoey hurries to the edge of the bed, scampers down her doggie staircase and runs to the patio door. “Let me out!” she says with a bark. (I know, I know, you’re not supposed to begin a story with a dream or waking up). Scene 2: Shelley eats breakfast, not sharing (here is conflict no. 1, because she should share, duh). After Shelley takes a shower (thank goodness I didn’t get a bath, because that would present conflict no. 2), she takes out the leash, and I do my let’s-go dance. Out on the walk, I see three big dogs walked by one person, and I bark my loud bark ready to take them all on (conflict no. 3, or maybe not, because I weigh 9.5 pounds). The rest of the scenes have to do with Shelley leaving me at home, so she can have fun, coming back and playing with me, and leaving again. The conclusion of the story is: my life kind of just happens. It’s not the stuff of bestsellers, though I am awfully cute. That is the real story, my extraordinary, extensive and ever-present cuteness, no matter what I’m doing. Zoey plays with her golden retriever friend, Sophie. 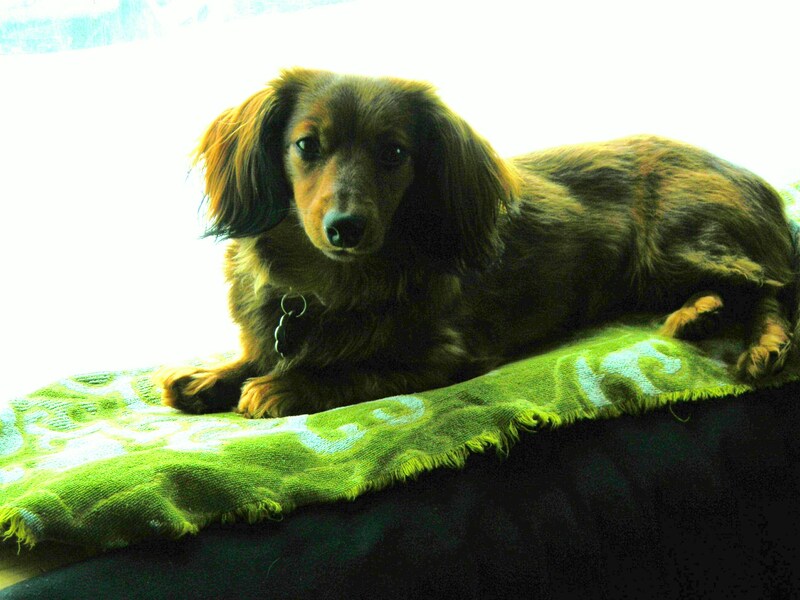 As the darn cutest dachshund ever, I am the main character in my life and certainly should be in Shelley’s life. But she goes to work and does things without me, which I find to be a bit discouraging. I want to be at her side at all times, and if not, than I want to be with someone else who can play with, pet and walk me. These someone else’s are the major and minor characters in my life. Shelley’s mom, who I see once a week when Shelley takes me there for a visit. I give her mom lots of kisses, get a special treat that I only get from her and no one else, and run around her backyard, barking up a storm. “Here I am!” I tell all of the neighbor dogs. Shelley’s dad, who lives inEastern Coloradoand who I see every couple of months or so. He plays with and pets me, plus tells me that I am cute. Well so does her mom, of course. Tim, Shelley’s best friend. I see him a couple of times a week on walks or at places where pets are allowed. He’s really tall and plays music. Shelley’s brother, who I see once in awhile. He thinks I’m cute. Shelley’s other friends, who I see if they happen to come over or if she brings me along, or out on our walks. Anyone who I see when Shelley and I are out on walks, and they have to stop and pet me and remark how cute I am. Well, duh! The employees at PetSmart who ooh and ahh over me when Shelley and I go shopping for my stuff. Shelley’s workmates, who I see on the rare occasion I actually get to go to work with her. As you can see, there are lots of people in my life, while there aren’t many dogs. 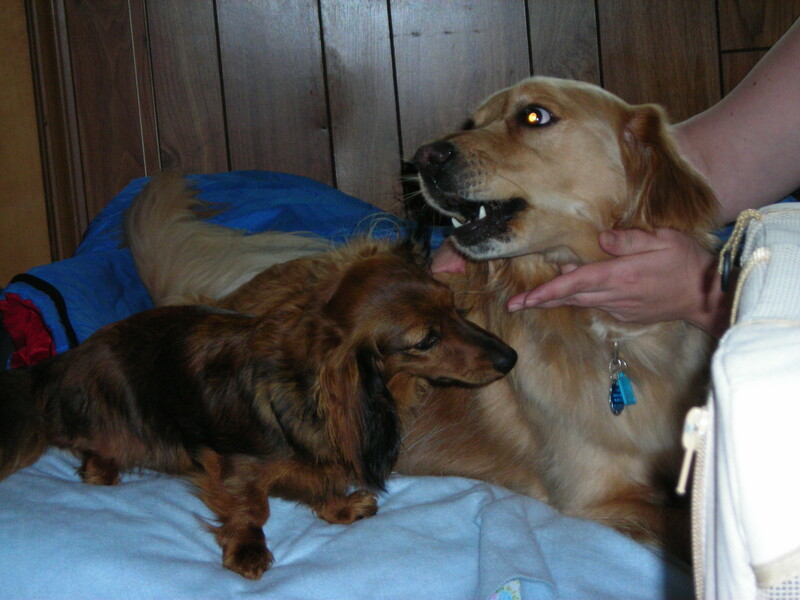 I have one dog friend, Sophie, a golden retriever who belongs to Shelley’s brother’s girlfriend. Sometimes they set up play dates for us, and we have fun. As for the other dogs, I bark to let them know I’m top dog and to ask them, with my wiggling tail, if they want to play. Shelley says I shouldn’t bark because that’s not how to make friends. But I can’t help it. As I’ve said before, I bark, therefore I am. Duh, as the cutest dachshund in the world, I am the main character is my and everyone else’s story. Zoey the dachshund lives in an apartment in a city in the middle of somewhere. She is looking out the window, waiting for Shelley to come home from a long day at work. “Let’s play!” Zoey says with a tail wiggle when the door clicks open. Shelley puts her work stuff away, but she doesn’t pay Zoey any attention except for a kiss and a quick pet. Why is she in a hurry? Why won’t she play? With! Me!! Zoey thinks and drops her head onto her paw. Upon hearing a noise, Zoey lifts her head. Shelley’s talk-talking away on the cell phone, the big antagonist to Zoey’s playtime. In a huff, Zoey runs under the bed, her place for pouting or hiding or taking a time out from the busy-ness of being a cute dog. Zoey has a journal at the ready to tell her stories. Duh, of course I want to do anything that involves you, Zoey thinks as she sits still waiting for what she had been waiting for all along: time with Shelley. It’s a love story, a girl and her dog. It’s also a mystery when Shelley will come home. It’s a horror, too, when Shelley can’t play. It’s drama. It’s comedy. It’s a dog’s life. This love that does not end, unconditional in its beingness.